In a couple of earlier articles, I looked at some diagnostics associated with the battery and the operation and checking of a dynamo. The final vital part of the charging circuit is of course the controller for all that’s gone before. The regulator, or cut out as it is often known, is a vital part of your charging system. There are basically three types, which I want to look at separately. Firstly, the electromagnetic cut-out. This is the type that was fitted when your Austin was new, and which survived relatively unchanged right up to the advent of the Alternator. The purpose of the cut out is very simple. If you look back at the article on the dynamo, you’ll see that the resistance of the windings is very low, about a third of an ohm. So, if the dynamo was connected to the battery but wasn’t rotating, we’d expect to pass the thick end of 20 amps down to earth from a 6V battery. Result? flat battery, burned out dynamo and probably fried wiring. The dynamo output depends on how fast it is rotating and how strong it’s field magnet is. So, the whole purpose of the cut out is to only connect the dynamo to the battery once it has started to put out more voltage than the battery can provide. For a 6V system, a fully charged battery has an output of 6.32V but the voltage necessary to actually charge it is more than 6.7V. The cut out therefore connects the dynamo to the battery when the voltage exceeds about 6.5V and disconnects it again when it falls below this value. How this works is that there is a coil of wire wrapped around an iron former, with a moving contact hinged over the top. This coil of wire is connected across the dynamo so that it forms a dynamo-powered electromagnet. Once the dynamo is up and running, and has got an output voltage that is sufficiently high so that power will flow from the dynamo to the battery and not the other way round, the contact closes and the battery and dynamo are connected together. As the dynamo speed falls, the voltage drops back down and the contact opens. However, this arrangement would never stop the dynamo from trying to provide enormous currents if the battery is faulty. Therefore a second coil of wire is placed in series with the battery. This coil sets up a second magnetic field such that when the dynamo voltage falls, the current flowing out of the battery and into the dynamo causes the contact to be opened again. It’s easy to check that the contacts are closing – just use the ignition warning light. Twelve volt systems work just the same, except that the cut out is set to open and close at about 13.7V. If you’ve got a regulator out of a Morris Minor or something similar from the ‘fifties, these are a bit more sophisticated, in that they control both current and voltage using two contacts. This has two regulators mounted side by side, the voltage regulator with its shunt wound coil, and the current regulator with a series wound coil. The two sets of contacts are connected in series with the field circuit so that if either contact opens, the field current, and hence the dynamo output, are reduced. Note that from the diagram, these require a dynamo only having two brushes. The mod here is to remove the field (moveable) brush and connect the brush contact to earth. The warning light is an ordinary low wattage bulb that is connected across the contacts of the regulator. Remember that the dynamo has a very low resistance? So, when the engine is stationary, the regulator contacts are open, (more of that later) and the lamp glows due to the path from the battery, through the bulb, through the dynamo to earth. Start the engine but run it slowly. The dynamo isn't producing much voltage but the bulb glows less brightly. This is because instead of the full battery voltage being across it, it now has the battery voltage minus the dynamo voltage. As the dynamo speeds up, the light will get dimmer. At some point, the regulator will operate. The dynamo is now putting out enough voltage to ensure that power flows from the dynamo to the battery, not the other way round or the dynamo would try to become a motor and burn out trying to drive the camshaft. At this point the regulator contacts close and the ignition warning lamp is shorted out. A slightly more scientific way is to connect your meter to the D and A terminals. With the engine off but the ignition on, you’ll see 6V, (or 12V) on the meter. With the engine running slowly, (such that the warning light hasn’t gone out), this voltage will reduce. At the point at which the contacts close, the reading will reverse slightly and then fall to zero. It is possible that the voltage here fluctuates and you can’t get a sensible reading. Don’t worry – this is the contact opening and closing, confusing the meter which takes a little time to make its measurement. Some dos and don’ts. DON’T adjust the little screw on the regulator unless you have access to a good electrical test bench. As you can see from the above, if you set the screw too far in, the battery will discharge into the dynamo and burn it out. Setting the screw too far out will stop the regulator ever closing and the battery will never charge. If you are very careful, you can use a piece of very fine wet’n’dry paper to clean up the contact if it has become corroded. For some 12V conversions, solid state regulators are available. These are little boxes of electronics that perform the same function as the electromagnetic cut out. What happens is that they stop current from flowing from the battery into the dynamo and electronically switch the dynamo into circuit once the output voltage is high enough. They can be temperamental: the circuit board inside doesn’t like to get too hot, so it is important that the back plate (or heat-sink) is connected to the car body using a good quality thermal jointing compound. Also, they are a bit delicate electrically – you can kill them off if you need to jump start your car from another battery. They are more common than you might think. Those of us that have caravans have one of these connected to the 7 pin socket on our moderns. The “voltage sensing relay” does exactly the same job for running the ‘fridge in the van. What happens is that with the car engine stationary, the battery voltage is about 12.7V. In this state, the relay is open and the fridge is disconnected. Caravan fridges take loads of power – your modern would pretty soon be flat. When you start the engine, and the battery voltage increases to about 14.2V, the relay closes and the fridge gets its power. Incidentally, these caravan relays are pretty cheap, at about £15 for a high current version. Another popular trick for a 12V conversion is the hot wire regulator. Instead of an opening contact, there is a piece of nichrome wire connecting the dynamo to the battery, via the ignition switch. How it works is simple: the resistance wire has what's known as a "positive temperature coefficient". This means that when you try to push a lot of amps through it, the wire heats up, the resistance goes up and the current therefore comes back down again. It is simple, cheap to make and most of the time works pretty well, provided that the rest of the system is in good order. All the time the dynamo is working and the battery is in a reasonable state of charge, the charging current flowing isn’t too large and the resistor simply varies to smooth out the excesses at high revs. The major snag with all this is that if the battery is allowed to go dead flat, the current required to charge it is enormous, the resistance wire gets cherry red hot and there is so much drop that the battery still won't charge or charges very slowly. All you do is generate stacks of heat. 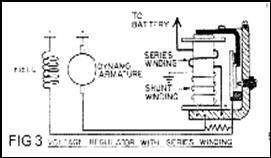 This is made even worse if the ignition is left on without the dynamo running - as there is no relay contact to disconnect the dynamo from the battery, and the dynamo isn't generating any power to oppose the battery, you flatten it directly through the resistor generating even more heat. This article, written by Geoff Hardman, originally appeared in CA7C Seven Focus in Oct 2005 pp16-18.